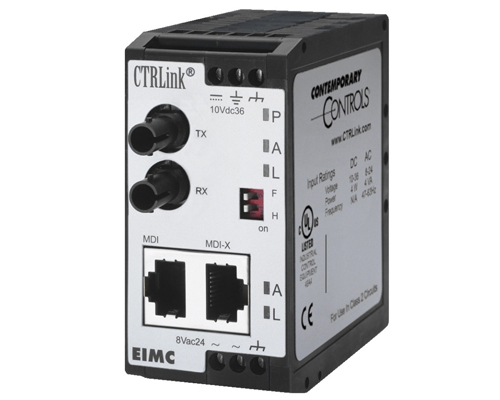 The EIMC series of Industrial Ethernet miniature media converters offers a solution for those industrial applications requiring a trouble-free, robust process of converting between copper and fiber media. The media converters are available in three models and all support full- or half-duplex operation. The EIMC-10T/F can operate at 10 Mbps and convert 10BASE-T to 10BASE-FL(850 nm) or it can operate at 100 Mbps and convert 100BASE-TX to 100BASE-SX (850 nm). Two models pass 100-Mbps data between 100BASE-TX and 100BASE-FX (1300 nm) segments: the EIMC-100T/FT makes the fiber optic connection via ST-style connectors, whereas the EIMC-100T/FC does so via SC-style connectors. Two front-panel DIP switches set the operational mode-full-duplex, half-duplex or transparent. Each unit will auto-negotiate data rate and duplex with its copper partner in transparent mode while only the data rate will be negotiated in either the half- or full-duplex mode. There is no auto-negotiation on the fiber side. The fiber port settings are slaved to what is negotiated on the copper side. In either half- or full-duplex mode, the EIMC-10T/F fiber connection can be up to 300 m under 100BASE-SX operation or 2 km under 10BASE-FL operation. Both the EIMC-100T/FC and the EIMC-100T/FT are limited to 412 m in half-duplex mode and 2 km in full-duplex mode. Transparent mode is intended for applications when a pair of EIMC devices terminate the ends of a fiber link. In this situation the two copper partners will auto-negotiate as if they were directly connected. However, if the intent is to link up at 100 Mbps, then either an EIMC-100/FC or EIMC-100T/FT should be used to ensure maximum fiber distance. If the application requires that an EIMC mate up with an existing fiber hub or switch; then it is best that the proper EIMC model be selected to match the data rate and fiber wavelength of the fiber port partner. Select half- or full-duplex operation accordingly and verify that the data rates on the copper and fiber end devices are the same. Several LEDs are provided for convenient front panel diagnostics. The Power LED (P) glows green when power is applied. Each port has two LEDs. The green Port Activity LED (A) flashes with activity while the link LED (L) indicates the data rate by color: green for 100 Mbps and yellow for 10 Mbps.